America went to war to gain territory from Mexico and expand the nation's boundary from Texas to California. 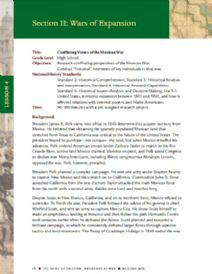 Students will learn about the Mexican War by first examining its causes, Texas's struggle for independence and the controversial concept of Manifest Destiny in this section of The Price of Freedom: Americans at War, an online exhibition. They will then learn about the war's major events and battles, and the results of the Treaty of Guadalupe Hidalgo, in which the United States annexed all of the territory that would become the states of the Southwest. 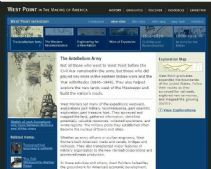 A non-flash version of this site is available: The Mexican War. 3A: Formulate questions to focus their inquiry or analysis. 3B: Compare and contrast differing sets of ideas, values, personalities, behaviors, and institutions. 3D: Distinguish between fact and fiction. 3E: Compare different stories about a historical figure, era, or event. 3F: Analyze illustrations in historical stories. 3H: Explain causes in analyzing historical actions. 3I: Challenge arguments of historical inevitability. 3J: Hypothesize influences of the past. 3E: The student understands the ideas that were significant in the development of the state and that helped to forge its unique identity. 2A: Identify the author or source of the historical document or narrative and assess its credibility. 2C: Identify the central question(s) the historical narrative addresses. 2D: Differentiate between historical facts and historical interpretations. 2E: Read historical narratives imaginatively. 2G: Draw upon data in historical maps. 2I: Draw upon the visual, literary, and musical sources. 3A: Compare and contrast differing sets of ideas. 3D: Draw comparisons across eras and regions in order to define enduring issues. 3E: Distinguish between unsupported expressions of opinion and informed hypotheses grounded in historical evidence. 3F: Compare competing historical narratives. 3G: Challenge arguments of historical inevitability. 3H: Hold interpretations of history as tentative. 3I: Evaluate major debates among historians. 3J: Hypothesize the influence of the past. This print shows American forces attacking the fortress palace of Chapultepec on Sept.